I love an all-paid-for birthday dinner and this time my cousin was so kind to have asked me beforehand whether I had tried Azure at the Mezz, because he'd celebrate his birthday there. When we arrived we walked through the Mezz area and couldn't find the restaurant. It wasn't until a good Samaritan asked if he could help us that we found out Azure is located on the main street of Scarborough Beach Rd. The Mezz itself was a cute little area with Missy Moo's, a free table tennis area, local fish and chips shop and spacious playground. 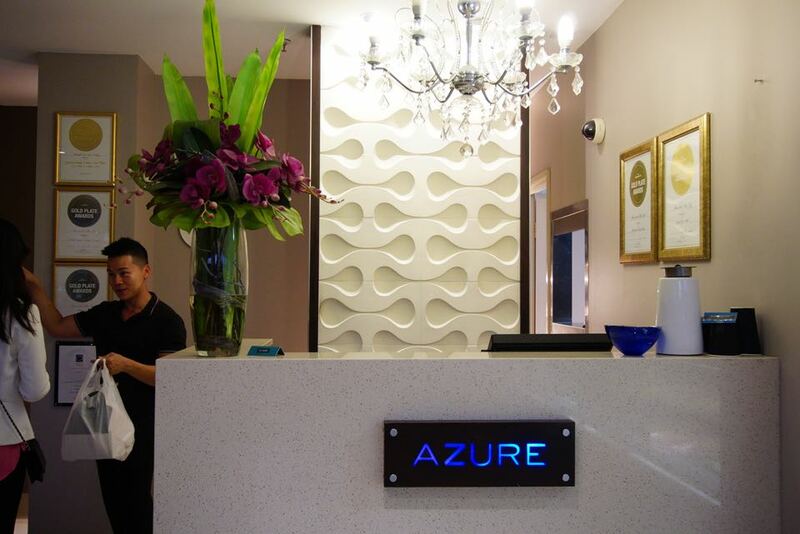 Opened in 2009 by owner and chef Christian Fogliani, Azure has become one of the area’s most respected eateries. Drawing on Christians 15 years working at Michelin guide rated restaurants in Europe and some of Asia’s finest deluxe resort properties, we offer a slice of Europe’s Mediterranean, with a gentle influence from South East Asia. They were right in saying that the food has some influences of South East Asia. Since we went for dinner on a Thursday night, the restaurant itself was quieter than usual. Even so we saw a good number of people had turned up for dinner, maybe about 14 other people in the same room. Not only that, Azure also has a collection of Gold Plated Awards decorated their wall as we walked into the premise. My grandma wanted to know how they put on such beautiful carved wall that went well together with the LED light. My uncle really liked the decoration too especially since he sat on the long sofa with many blue and white cushions. Our entree came out quite quickly. Crispy squid tentacles with Vietnamese salad & chili mayo was the winning entree of the night. It was presented beautifully and the the salad was very fresh, I probably can eat it everyday. The crispy squid tentacles tasted lightly crunchy and went well with the mayo. Just like the squid tentacle, our next entree, crumbed eggplant with basil aioli didn't disappoint as well. The crumbs made the eggplant crispy on the outside while still retained the creamy texture on the inside. Other entrees that we had on the night was the grilled strips of pork belly with romesco and chorizo served with lemon. The only feedback was that the romesco could be a bit more peppery. Azure has a good $29.50 special deal for the night which consists of one main and one antipasto platter which only applies for Tuesday-Thursday dine in. The staff confirmed that there was no difference in the portion size of the main meal. My aunt and hubby decided to go for the special. As you can see on above image, the antipasto platter was quite huge and can be shared between 3-4 people. It took quite a while for our main to be served but when the staff put the meals on our table, our faces literally lit up with joy. The Black Angus was a 4hr braised beef cheek in star anise, honey and wine. The beef was very tender and it tasted really closely to Indonesian beef stew called 'semur' or 'smoor' / smothered (Dutch) , the difference was that the beef cheek was served without drowning it in a bowl of thick gravy. I grew up eating this so the taste really brought me back to when I was a kid. Served with creamy mash potato, it was a beautiful combination together! The barramundi wasn't available for the night but grams agreed to the salmon served with apple salad and tomato salsa that was suggested as the replacement. Her piece of salmon was huge! It was served with another refreshing apple salad that I really like. Grams happily gave out half of her salmon to hubby, who happily accepted any meal that he could get that night (hahaha). My other favourite was the fettucini with prawn and creamy vermouth sauce. The pasta was cooked al-dente and so perfect when mixed together with the sweet buttery Vermouth sauce. I really liked this dish a lot that I took a few spoonful from Hubby's plate. The last main meal to arrive was the crispy skin pork belly. Sometimes when the menu said crispy, the skin turned out to be 'just okay' but this dish stayed true to the description! There were 3 big pork belly on the plate and I gave the skin to my cousin (who celebrated his birthday) and hubby. Both of them were huge fan of pork and pork knuckle and both appreciated the crispiness of the skin. The meat itself was very tender and I love the idea of mixing it with kimchee. The lychee, mint and radish salad was a clever combination of palate cleanser and I wish they offer this salad as one of the side dish. One of the highlight of the night was the service. It was only one staff who worked on the floor but he remembered each of our order without having the need to have a notepad and pen on hand. He also the one who started to sing the 'happy birthday' song and I think he sang the loudest out of us all! The dinner won't be as enjoyable without his friendly presence. PS: Happiest birthday, dear cousin!